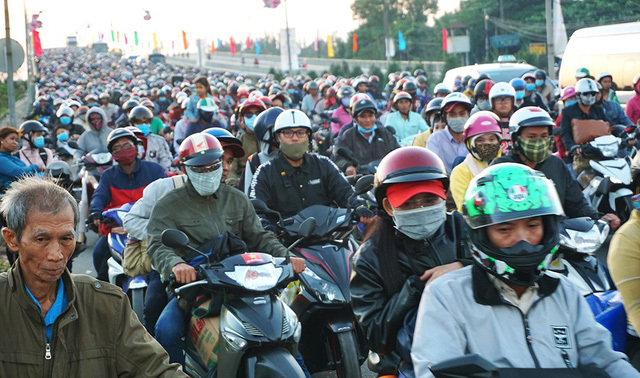 Residents in Mekong Delta provinces in southern Vietnam once again went through an agonizing journey back to Ho Chi Minh City as many routes were seriously overloaded and congested on Sunday, the last day of the Lunar New Year festival. Public workers in Vietnam were given days off from February 2 to 10 to celebrate the Southeast Asian country’s biggest holiday and were scheduled to resume their work on Monday. The post-Tet rush was no less appalling for the Mekong Delta residents, who previously also had to go through heavy traffic jams to return to their hometowns from Ho Chi Minh City to be with their families during the long break. With the nine days of celebration ending on Sunday, it was time they embarked on another tough journey back to the southern metropolis for work. The Mekong Delta consists of Can Tho City and 12 provinces. While some decided to come back to the metropolis early in order to avoid traffic jams, the majority still waited until the last festive day to start the journey, and thus were inevitably caught in excruciating congestion en route to Ho Chi Minh City. According to the observation of Tuoi Tre (Youth) newspaper reporters, gridlock occurred at such hotspots as Rach Mieu Bridge, which connects Ben Tre and Tien Giang Provinces, Dong Tam and Luong Phu Intersections in Tien Giang, and N2 Road in Long An Province. Commuters, however, considered these locations the “easier parts” of their journeys, as the most severe bottleneck was at My Thuan, a 1.53-kilometer bridge linking Tien Giang and Vinh Long Provinces. To make matters worse, a 29-seater passenger bus broke down in the middle of the bridge at around 9:30 am on Sunday, resulting in further congestion that lingered well into the afternoon. Countless vehicles heading to the bridge were unable to move, forming a snarl-up that stretched as much as 40 kilometers. Other alternative routes were also jammed. “It was horrific. It took me three hours just to travel from Can Tho to the end of My Thuan Bridge, while it normally takes more than an hour,” Nguyen Van Nam, a commuter, complained. Dang Ngoc Chau, another resident, said he and his family members started leaving Ca Mau Province at 3:30 am. After six hours, the family only reached Vinh Long Province, about 180 kilometers from Ca Mau, Chau continued, adding that it usually takes four hours to cover the distance. According to Senior Lieutenant Colonel Nguyen Van Dung, deputy chief of traffic police in Vinh Long, congestion in the province was slightly alleviated as of 5:00 pm on Sunday, as vehicles started to be able to move at a slow pace. Traffic police units exerted their best efforts to ease the situation but it did not appear to be effective. As of 9:00 pm the same day, a large number of commuters could still be spotted along the Mekong Delta - Ho Chi Minh City route. Many motorcyclists decided to take a break at cafés and diners along the roads, while some even considered spending the night at local hotels.